Are you looking for a serious cruiser that still guarantees comfort all the way you ride? The Detour 1 step Thru comfort bike promises a remarkable city riding experience. This is the kind of stylish bike that comes equipped with serious features to meet all your city cycling needs. Its unique design seamlessly fuses style, comfort, and function to produce a commanding comfortable bike. Two things about this bike will rob your attention from the start; a comfortable spring-loaded wide saddle and a unique sturdy step through frame design. The two will force you to a nice and comfortable position for a great around the city cruise. This city bike comes loaded with high-performance features to offer the ultimate city side riding experience. A comfortable road style step-through frame design makes the bike easy to mount on. This design also offers a comfortable riding position for long distance riders. The stylish frame seems thoughtfully designed to couple with a comfort grip handlebar, offering unwavering agility. This makes the cheap bike perfect for both city cruisers and commuters. What’s more, its sturdy lightweight steel frame design makes it firm, durable and manageable. A city bike boasting of comfort features such as the Raleigh Detour 1 needs to get the rider in a good cycling position. This city ride comes with a unique spring-loaded comfort saddle that makes cruising in rougher terrains more enjoyable. The springs absorb shock from bumpy and rugged terrains for the ultimate comfortable ride. Alloy micro-adjustable seat post makes this affordable bike to be ridden by an enthusiast of different heights. You can never overlook the comfort features a bike you plan to buy offers. Comfort is crucial for realizing an unforgettable cycling experience. Moreover, comfort guarantees a reasonable amount of stamina for when you want to attain top speed. It’s quite impressive how gentle the handlebar grips for this bike are in the hands of the rider. The handlebar is made of steel so it is sturdy and it rises high so it forces your body to a nice and comfortable cycling position. This helps reduce strain on the neck and lower back. A bike that comes with a serious drive train such as the detour 1 surely must have some authoritative braking systems. Certainly, the front and rear alloy calliper brakes that come with this bike provide an impressive almost-instant halt; thanks to its superior side-pull brake design. The Raleigh Detour 1 comes fitted with some high-performance wheelset for the ultimate city side cruising. Its triple walled 700-32c tires offer a good traction and reduce rolling resistance, helping in the attainment of high speeds. The tires are durable and feature dominant threads that are ideal for road and off-road cycling. Its robust alloy rims with strong spokes will not crack no matter how rough the terrain can get. With this entry level bike, you simply enjoy every turn, no matter where you want to go. If you’re looking to ride in style, no city ride can beat this entry-level Detour 1. From its step-through frame design to the spring-loaded saddle, this bike was designed with a passion for the city cycling enthusiast. You will be amazed how the designers of this bike were able to fuse a minimal design with practical features to seamlessly produce a high-performance comfortable bike. Its color schemes blend in stunning fashion to produce a beautiful city raleigh bike. 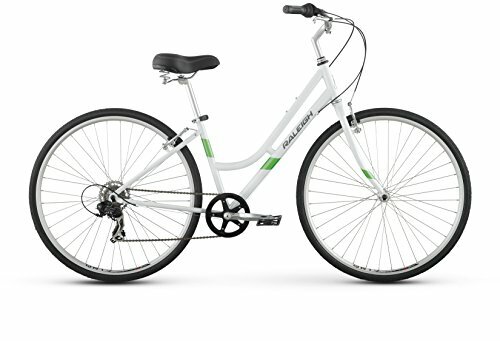 The Raleigh Detour 1 Step Thru Comfort Bike is a comfortable, agile city bike. It comes equipped with high-performance features and a stylish design that makes it a great choice for commuters and city cycling enthusiasts alike. Its light portable nature makes it a smooth ride through the city roads while a high-performance wheelset offers an impressive off-road cycling experience. What you will like most about this ride are the comfort features it comes with. It’s simply an easy ride for a stylish cruise around the urban roads.